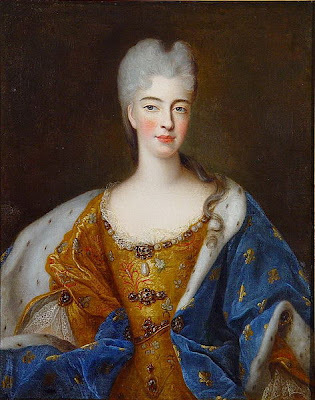 Élisabeth was eventually married at the age of twenty two, which was absolutely elderly by the standards of the day, to the Duc de Lorraine, who was a bit of a step down for a Princess who had been considered a suitable bride for a King and Emperor. The wedding was a very grand affair and took place on the 13th of October 1698 in the chapel at Fontainebleau in front of her family and the entire court, who were probably relieved to have her married at last and also to someone who wouldn’t prompt her terrifying mother to lose her temper with the King. It wasn’t a love match and had been engineered by necessities of state, but Élisabeth and her new husband, Leopold fell deeply in love and were to be immensely happy together bar a rough patch in the middle of their years together when he had a bit of a mid life crisis and took up with a glamorous French noblewoman. Their chief residence was the Château de Lunéville, which her husband extensively rebuilt and which became known as ‘the Versailles of Lorraine’. The proximity of Lorraine to Versailles and Paris meant that Élisabeth was a lot more fortunate than many other Princesses, including her own grand-daughters, the daughters of her son Francis and Maria Theresa, who were sent away from home at an early age never to return. Élisabeth, on the other hand, was still able to see her family if not as much as previously then more often than perhaps she could have hoped for before her marriage. She was even a guest at all the great events of the time, including the coronation of her cousin, Louis XV at Rheims Cathedral.